Electric vehicle market has registered favorable growth since its inception into Indian market. Concept of self balancing scooter is new in India, however it holds immense growth potential. Presently, India's self balancing scooter market demand is primarily derived from Tier-I cities. 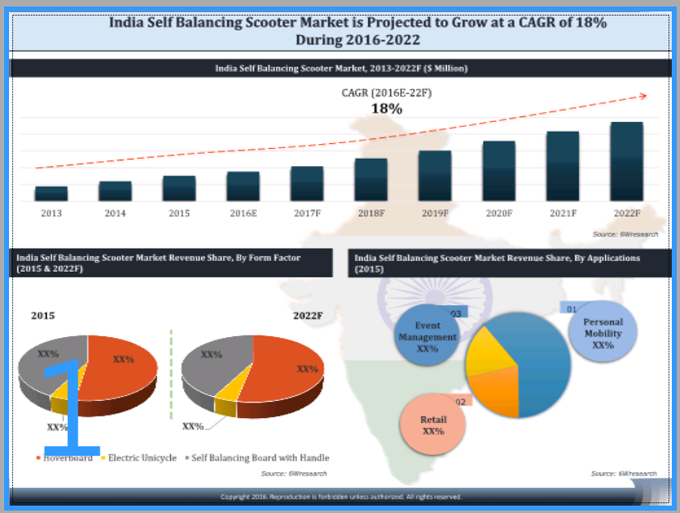 According to 6Wresearch, India self balancing scooter market is projected to grow at a CAGR of 18% from 2016 to 2022. In form factor type, hoverboard accounted for majority of revenues in the overall market, wherein Ninebot led in terms of market share followed by Airwheel and others. Hoverboard leads in Indian market owing to its low cost and ease of availability of these over e-commerce websites. Additionally, personal mobility application acquired largest revenue share due to increasing usage for recreational and commuting purposes in residential premises, entertainment parks and educational institutions. The report thoroughly covers self balancing scooter market by form factor and application. The report provides an unbiased and detailed analysis of the on-going trends, opportunities/high growth areas, market drivers which would help the stakeholders to decide and align their market strategies according to the current and future market dynamics.